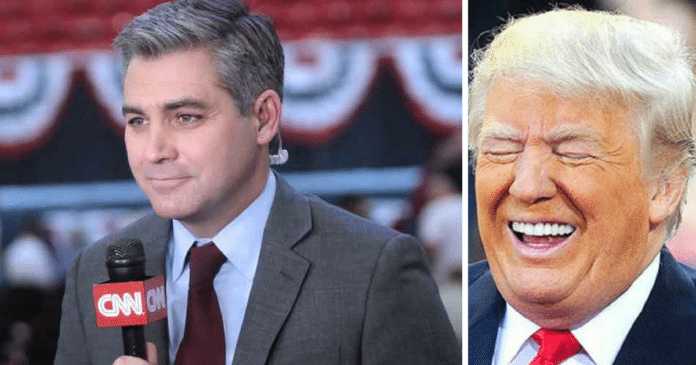 The notorious fake news CNN “reporter” Jim Acosta has struck again during today's White House press briefing, making demands at Press Secretary Sarah Sanders that she denounces President Trump's accurate sentiments about CNN being the “enemy of the people,” a laughable attempt from a petty man to pretend he has any authority over the Oval Office. During the briefing, Acosta rudely began to raise his voice, speaking over other members of the White House Press Corps as if his opinion is more important than anyone else, showing zero class in the process. For those unfamiliar with what Acosta is referencing, his feelings are hurt because President Trump has labeled the likes of him and his network “the enemy of the people,” and in response, Acosta is trying to get Sarah Sanders to go against the Commander-In-Chief, and give her opinion. For one, Acosta doesn't seem to realize that Sarah Sanders isn't the President, and he's made his opinions of CNN and Acosta well known, it's not a secret that we can't stand either. Jim Acosta thinks that he can tell Sarah Sanders how to think, or what's best for her to answer with. That's laughable. It is outrightly sad, considering the media is responsible for churning lies and opinions towards this Administration. These lies are libel, if not slander, and often threaten those within the Administration after CNN odr a similar network propagates such lies that drive the Democratic Party’s lunatic voters to stalk and harass their families. Just listen to the rhetoric used by Acosta at the Trump rally in Tampa, Florida earlier this week, where he has zero interest in reporting on the news, or current events, but instead to spout opinionated propaganda against President Trump and his supporters. It's pathetic, and it's dangerous because it invites the radicals of the left to commit violence against what they wrongly perceive to be a “threat” from Trump supporters. Jim Acosta has a history of choosing to remain petty, and promote outright <i>speculation</i> versus any attempt at actually <i>reporting the news</i>. Hilariously enough, Acosta is the CNN “Chief White House Correspondent,” making the rest of their staff look like teenage bloggers if he's the best they have to offer. When President Trump invokes the First Amendment, he can say whatever he likes, regardless of who it offends, and that's the beautiful thing about America. Most Americans would agree that the slanted coverage from the fraudulent news networks is responsible for division and dissent in our country, of which CNN heavily perpetuates the hatred premise that the Trump Presidency is somehow deserving of delegitimization, which is the furthest thing from the truth. It's boiled down to elitists versus the American people, and we continuously have those very elitists attempting to lecture us or guide our lives and attack our values. The “news” from CNN, and quite frankly all of the mainstream media, is nothing more than propaganda. There's no “news” being reported anymore, and the American people are aware of this. Instead of focusing on absolute facts, every comment coming from the likes of Jim Acosta is purely opinionated and biased talking points that benefit the Democratic Party. Sadly enough, they use well-known faces, such as that of Dan Rather, <i>who himself was shamed off the CBS Network for lying to the American people</i>, to try and be a figure of moral authority. It's laughable, and it's downright pathetic. It's not a mystery, and things are only going to get worse. It's now patriots who love the freedoms of America and stand with our President, versus literal Communists who cry like third-grade school children when they don't get their way. It's going to be a long six years for Jim Acosta, and anyone in the mainstream media who puts propagandists claims over facts and truth. The fake news colluded with the CIA and FBI on 9/11 to lie to WE THE PEOPLE about who really torture-murdered 3000 on that fateful day. do a search for "scholars for 9/11 truth and justice " . He will probably whine and cry until he realizes no one is listening or cares. I'll say this for him, if he held his breath until someone listens……he would be purple. The fake news lied to the American people to help totally corrupt politicians and elitist get America into two false wars where millions died! I consider that a enemy of the American people! The CNN FAKE NEWS HOUR.